Several men in Household Cavalry uniform are in a vault, photographing confidential documents. One of them, who has been passing the papers out under a security sensor, accidentally trips the alarm when a document blocks the light beam. The steel gate slams shut, trapping him inside. The ringleader (Harvey Hall) glares at him angrily, then orders his other accomplice to kill him. Steed drives Mrs Peel to the home of Sir Clive Todd in the early hours of the morning. She complains about it being the middle of the night but is jolted awake by the sight of the butler (Harry Hutchinson) wearing a surgical mask. She sees the uniform laid out and asks Steed if he did wake her, or if it's a fancy dress party. The doctor tells them the bullet missed his brain and they can see him. Steed explains that Sir Clive (Laurence Hardy), dressed in uniform, broke into an office in Whitehall with some accomplices and was shot during the successful raid. Sir Jeremy (John Wentworth), another cabinet minister, can't believe it but Major Plessy (Manning Wilson) says the facts are undeniable. 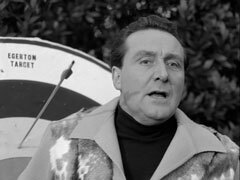 Steed says Todd will pull through, and Sir Jeremy wonders if the government will, then departs to report to the Prime Minister. Steed tells Mrs Peel there has been a series of such raids recently, all executed perfectly and they hope Sir Clive can lead them to the 'diabolical mastermind'. Steed comments on Mrs Peel's resemblance to Florence Nightingale and she is installed as Sir Clive's nurse. She discovers he's suffering from amnesia and Dr Fergus Campbell (Ian McNaughton), a service psychiatrist, is called in to examine Sir Clive. Steed returns to Sir Clive's study to resume his search and spots a pistol poking out from behind a curtain. He tackles the owner and finds it's Sir Clive's rather scrummy daughter Davinia (Georgina Ward), just return from the South of France, still in her bikini - "I got bored on the beach so hopped in a cab. My clothes are following". She tells Steed her father was probably out with Allan St. Johnson, an opposition MP, and her father belongs to a club for eggheads called RANSACK. She shows him a secret compartment in her father desk but someone has poured acid in, destroying Sir Clive's diary. Meanwhile, Campbell seems to be trying to ensure Sir Clive's memories are lost rather than restored. Steed visits Whitehall to see the MP. Sir Jeremy and Major Plessy urge restrain, fearing a leak of the scandal, but when Allan's secretary shows him in, they find St. Johnson dead, apparently a suicide. Unfortunately, his secretary had not seen the constituent who had come to see St. Johnson before they entered. Steed returns to Sir Clive's house, where Mrs Peel says Sir Clive is starting to respond. Steed fetches Campbell and finds him in the company of Desmond Leeming (Bernard Archard) who helps run RANSACK. Steed says he's interested in joining and is handed an entrance paper - the minimum IQ for entry is 145 - at which campbell sneers at Steed. On parting, Leeming stresses to Campbell he should be "informed of any change for the worse, if he should have to resort to drugs". Steed helps Mrs Peel jog Sir Clive's memory with the word "Ransack", then Campbell lethally injects Sir Clive while they talk, but is unable to tell them why he killed him. Campbell's memory is blank but he swears he hadn't left the house that day - the only person he met was Leeming, and he admits to being a member of RANSACK himself. Steed meets Mrs Peel at the bar in the Houses of Parliament where she's fending off the advances of a philandering MP. "Lobbying?" he asks and she replies, "I don't have to" - they've both gained entry to RANSACK (she did both their papers) and they were so impressed with her, she's been hired as Professor Spencer's secretary. They run their events at a girls' boarding school near Oxford. Steed smiles and is told the girls are on holidays. 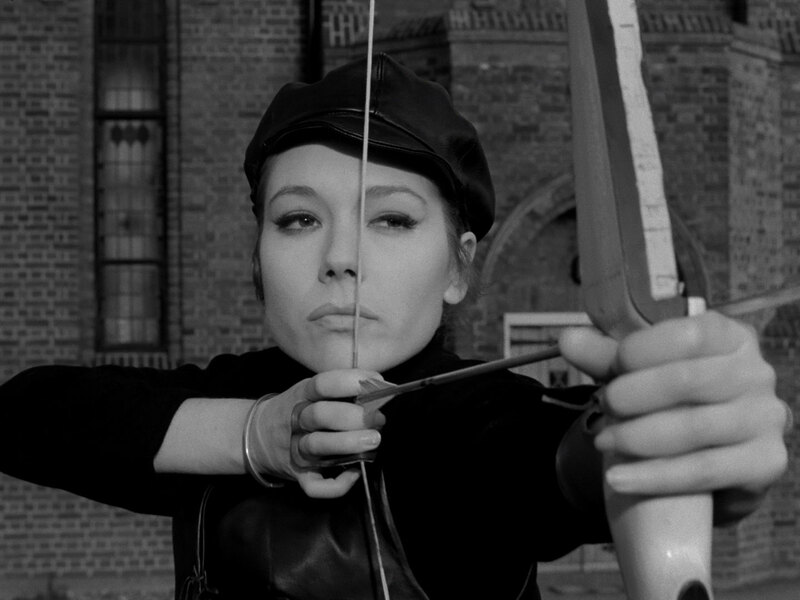 Steed goes to the school next day and finds Holly Trent (Patricia Haines), the school games mistress, conducting archery lessons for some of her staff but she plans to lure some of the intelligentsia out. Leeming interrupts as Steed fires an arrow, causing him to break a window, and leads him away. 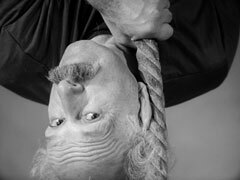 He's led through a babble of high-brow conversation to meet Professor Spencer (Martin Miller), who is standing on his head to increase blood flow to the brain. Emma enters and says she has to complete all of Steed's details for their records - outside, she hands him the answers for the day's test paper. Sadly, he can't fit enough of them on his cuffs and she has to falsify his score to bump him back into genius territory. That evening, Steed retires to his room and disconnects the annoying piped music. Mrs Peel delivers his cocoa and raises her eyebrows at the pictures pasted in the girls' lockers. A while later he hears a noise and sees all the others - including Emma - trooping downstairs. He follows cautiously and finds them all watching a film of an RAF base. He hears someone coming and hides - it's the leader of the Whitehall raid, who sits down to guards the film hall. In the morning, the hall has returned to gymnasium duty and Mrs Peel declares she never left her room last night. Leeming makes an announcement - everyone is to meet in the gym at 6 o'clock that evening. Steed turns up on time but no-one else is there - except Professor Spencer, hanging from a rope up near the roof. Outside, he's nearly shot by Holly Trent's archers and she tells him the others left in the school minibus half an hour ago - didn't he get the message? Professor Spencer tells him Leeming has taken them to do outside IQ tests, despite Steed being amazed they'd do it in the dark. They return in the early hours of the morning after conducting an armed raid and Steed sees them carry something into the school. He finds sand in the bus - and later proves to Emma she wasn't in a forest as she recalls by emptying sand from her shoes. She finds a piece of a missile head still in her coat pocket and Steed tells her there's a missile base 60 miles away, on the coast. Steed calls Plessy and learns the probable successor to the Polaris missile was snatched the previous night - but he's overheard by the ominous raid leader. Steed tells Mrs Peel, who's busy bouncing on a trampoline and she's denying knowing anything about the naval base until she says, "How could anyone jump a 15 foot 5 live wire?". Steed visits Campbell, who tells him hypnotic suggestion would work very well if the subject were already asleep. That night, he sniffs his cocoa and sets it aside, then sees the eggheads all go downstairs again. He checks Emma's room and hears a distorted voice ordering everyone to the gymnasium. In the gym, the same voice asks them all to plan how to steal a plane from an airfield. 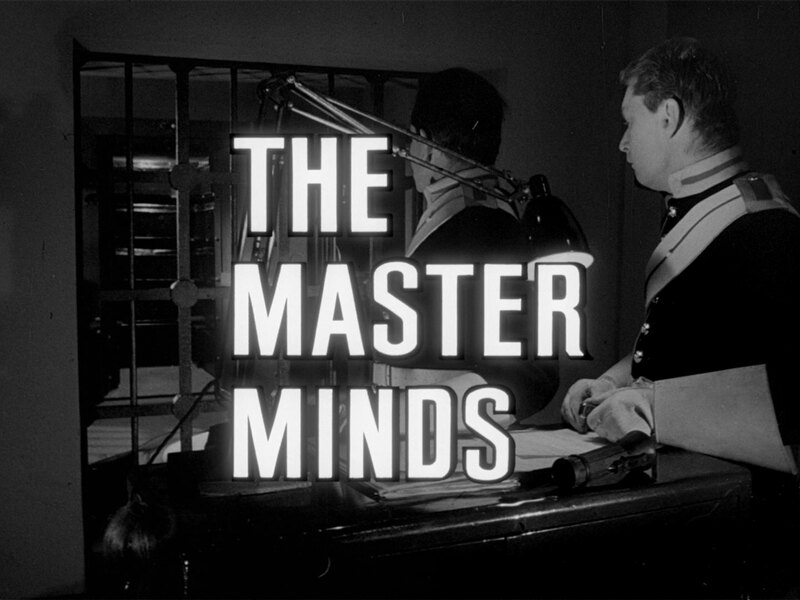 Steed suggests cutting the water supply to the base after Emma advocates laying a fire near the guards' quarters. Meanwhile the raid leader checks Steed's room and finds his loudspeaker is unplugged. He hears the end of the meeting downstairs - the unseen boss orders them all back to their beds, to reconvene at the archer range in an hour. They leave and the raider informs Leeming Steed is a fake so in an hour's time, the voice orders them to the gymnasium instead of the range. There, they determine Steed should be killed and Emma volunteers to shoot him with an arrow. Steed stands in front of the targets and sees her approach, then fire an arrow at him. She reports him dead to Leeming, but the raider has found Steed's note to her, "Unplug your radio. S". Steed swings across the gym on a rope and disarms Leeming, who has just pulled out a revolver and they fight, another egghead (Ray Austin) joining in. 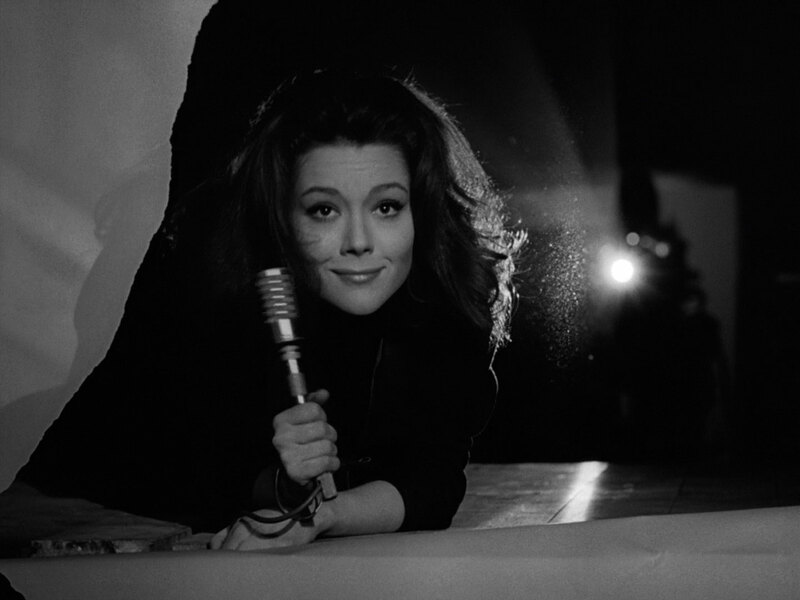 Mrs Peel meanwhile enters the projection room and fights the mastermind in silhouette, the villain finally crashing through the screen and revealed as Holly Trent. Mrs Peel reflects on the cleverness of harnessing genii as they drive home in Steed's Bentley. Steed says at least he's come out of it with a genius IQ. "You are a genius", she says, " - at cribbing", and laughs.